About 80,000 customers switched their bank account away from TSB in 2018 – 30,000 more than 2017 – after some people went weeks without services. In recognition of the extra work for its employees, the bank said it had awarded staff – excluding executives – £1,500 each in December. No bonuses are being paid to executives for 2018. But the most significant of all is an inquiry by the Financial Conduct Authority, the City regulator, which has powers to issue fines of many millions of pounds. 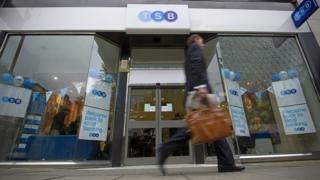 Last summer it was critical of TSB’s response to the crisis, but its in-depth investigation – undertaken jointly with the Bank’s of England’s Prudential Regulation Authority – could take months to complete. Chief executive Paul Pester stepped down in the wake of the fiasco. Nicky Morgan, chair of the Treasury Committee, said at the time that Mr Pester “set the tone for TSB’s complacent and misleading public communications”. But it maintained that it was “one of the most strongly capitalised banks in the UK and, with a healthy liquidity reserve, is well positioned to weather economic uncertainty or shocks”. TSB’s Common Equity Tier 1 capital ratio – a key measure of financial strength – stands at 19.5% and is among the strongest of UK banks.